A Superman Who Couldn’t Even Crawl - Will AAP be the “Tehelka” of Politics? Before Delhi assembly elections, government formation and quitting after 49 days, AAP supporters really thought (some still do) Arvind Kejriwal as some messiah who had ready-made solutions and he would solve all problems within few days of taking charge. Kejriwal himself was responsible for this “Messiah Status” as he always said as activist that people who are ruling don’t want to do their job otherwise all issues can be solved in one day. He made impossible promises with impossible deadlines – none of his followers ever questioned the feasibility of his promises. His cult grew in name of honesty, simplicity and anti-corruption. Many of his supporters projected Congress and Narendra Modi led BJP as brothers in arms (or two-sides of the same coin). AAP supporter’s favorite slogan was “Cong-BJP Bhai Bhai”. When anyone tried to reason with them with facts, they replied with the same lines again and again. Their messiah too swore on his children’s lives that he will never give or take support from Congress or BJP. He said it in his loudest voice that it would be cheating with people as people are voting against Congress and BJP to his party so he will never break their faith. But what happened in the end? He gave some made-up logic to justify his action to his politically naive supporters – and they lapped it up too! Though one must admire Kejriwal’s confidence (or political acumen) as he says many things and then U-turns to says exactly opposite things after sometime, all with full confidence. Wonderful thing is some people still gets convinced with both things that he says. Kejriwal could have been a very good Congress politician of 1970s and 80s, where not many means of communication were available. Unfortunately for him, in age of social media, it has become next to impossible to carry on with shallow dramas for long as people can see truth very easily and in less time. Social media has played a very strong role in making Kejriwal of today. To his credit, he exploited every available platform to full extent. When no one in main stream media knew anything about him, he used all available and even the “communal platforms” of RSS to spread his message. He then became a regular visitor to Baba Ramdev’s meetings and used Baba Ramdev’s resources to gain more acceptability. When Baba Ramdev and Sri Sri Ravishankar brought Anna Hazareji from Maharashtra to Delhi to fight against Congress’s systematic corruption, Kejriwal saw opportunity and jumped to Anna’s side. When their utility was over than suddenly Sri Sri Ravishankar and Baba Ramdev became too communal for him like RSS and he found great support from left leaning organizations. He portrayed himself as Anna’s General, became a household name, in time of “Indian Against Corruption Movement” took support of BJP under Gadkari and as it happened with all others, after their utility was over, they were discarded too. He used volunteers of IAC for his online and social media promotion. I, an Aam Admi as any Amrud can get, also supported him at that time. But I didn’t know. Anti Congress people like me have been using social media to promote Narendra Modi’s good governance stories from a time when no one heard of Kejriwal. First it was Orkut (Social media networking site like Facebook-many might remember), Blogger and later Facebook and Twitter. BJP’s supporter use social media as main stream media (MSM) was more or less in control of Congress. Many politically aware people might have noticed that in last 13 years MSM, most of the times try to show Modi and BJP in bad light, because of either money or left leaning ideological reasons. Very recently MSM channels were forced to live telecast Modiji’s speech as his popularity grew because of his good governance and people wanted to hear more about him. Media had to show his speeches but they were very quick to point out flaws in him. Prime time discussions still mostly end with one BJP spokesperson versus 5 or 6 anti Modi panelists. That’s why Narendra Modi relied heavily on social media to get his message across and establish direct communication with voters. If MSM showed what all Modiji did all these years in Gujarat, like they are making positive national news of even the “loose motions” of Kejriwal, Modi would have been a Prime Minister candidate in 2009 elections itself. IAC was primarily representing educated middle class’s anger against Congress mis-governance. Congress first dismissed this as it knew that middle class is too lazy to vote against it in big numbers and Congress main vote bank is poor and minorities. But later on realization of mass anger if educated middle class, Congress infiltrated and broke the movement via likes of Agnivesh. Kejriwal too was always in touch with his guru Aruna Roy, who is part of Sonia’s NAC. The day Yogendra Yadav, a known Congress sympathizer and former Rahul Gandhi adviser, joined Kejriwal in politics; the game-plan of Congress for 2014 general election became clear. Many might know that Congress generally wins by dividing voters in first past the post system of democracy. Congress uses this strategy quite frequently and you really have to be politically illiterate to not to know about it. Few recent examples can be like Congress propped up Chiranjeevi’s Praja Rajyam Party, divided vote, won election in Andhra Pradesh and later merged PRP with itself. Similar strategy worked in Maharashtra with MNS and KJP in Karnatak. Since Congress may still exercise control on poor and minorities, there is a big chance that educated middle class will vote against it in coming elections. Here Kejriwal and AAP’s role becomes increasingly important in Congress 2014 scheme. AAP will cut educated middle class anti Congress pro BJP / Modi votes nationally as people don’t know AAP in villages that’s much so in that way will hurt BJP and Modi, and in some way benefit Congress. After declaring Modi as PM candidate, BJP was riding high and won Madhya Pradesh, Rajsthan assembly polls by big margin and Chhattisgarh with comfortable margin. In Delhi, which could have been big BJP win, Kejriwal with AAP divided anti Congress votes and made a make-shift Congress rule possible by forming government with their support. Inspite of being the largest party BJP did right thing by not forming government in Delhi as it didn’t have numbers but from here on Kejriwal’s messiah status increasingly started coming in doubt. He was so confident in telling before elections that you can’t clean corruption, if you ally with Congress and similarly he was comfortable in asking Dr Harshvardhan evidence of Congress corruption after he took Congress support and formed government. In a span of less than 20 days, after he formed government, Kejriwal has broken all what he stood for before elections. As I said I am really becoming a big admirer of his confidence in telling two exactly opposing thing in just span of few days. To top it all Kejriwal ran away from his own Swaraj-experiment of Janta Darbar. My question is, can’t his other schemes fail like this too? He is good salesman, I’ll give him that much credit. But that doesn’t mean his well-sold schemes will not be massive failures like his Janta Darbar and other subsidy-powered schemes. Is India ready for such experiments at national level? Kejriwal and AAP are looking increasingly like Tehelka magazine of politics, all song and dance of morality and ethics in beginning but in the end “no personal integrity or actions to match those BIG words”. People, who supported Kejriwal, never get tired of comparing him with character of Anil Kapoor in Nayak movie. But someone please tell them that Anil Kapoor didn’t make government with Amrish Puri in Nayak and road-side justice of Bollywood movies can’t really be replicated in real life. Since media can’t flog dead Congress horse as many educated people have become repulsive to Congress, so Modi hating media is doing propaganda for Kejriwal’s or any so called leader of AAP’s every small move. His love-hate story with media is still going on. Sometime ago you all must have noticed that Delhi media has almost forgotten that there is India beyond Delhi and politicians beyond Kejriwal. For Delhi based media India has become some neglected North East state on which they never do reporting. I just hope that people can see through smokescreen as Kejriwal is proving to be a FAKE SUPERMAN who couldn’t even crawl. I hope that voters won’t waste their vote and support which may contribute to instability post 2014 elections. If you are willing to give Kejriwal time to do his unproven experiments at your cost then why can’t you be wiser for 2014 elections and give support to already proven Narendra Modi so that he can implement his proven solutions? Is it too hard to understand? In the end, I do not want to be only critical of Aam Aadmi Party – many ask me that don’t I see anything positive about AAP. I concede there, AAP could have their positives — but does that mean one should overlook all it’s flaws and lies? AAP and Arvind Kejriwal ask for very high standards from politicians. That is good. But when the time comes to apply those standards to themselves, they give you some made-up logic, which only their blind supporters can accept. I’m very keen at what “results” can this party produce at small level – for that they’ll have to be patient. But I don’t expect Mr Kejriwal to be that patient. His biggest problem is his over-confidence and over-ambition. He may pose as the true representative of common masses, but in reality he’s only representing his own ambition. Congress and BJP might not be the ultimate solutions – but they’re not equal either. The biggest lie Mr Kejriwal is telling the people of India is that Congress and BJP are the same. He’s doing that only so he can project himself as the solution – all without proving himself even a little bit first. I cannot stop wondering that AAP can’t see that their antics are only creating a possibility of a UPA3, interestingly, they never give a satisfactory response to this question. Basically, they’re happy with a fractured mandate than giving India a proven and stable model at the center. 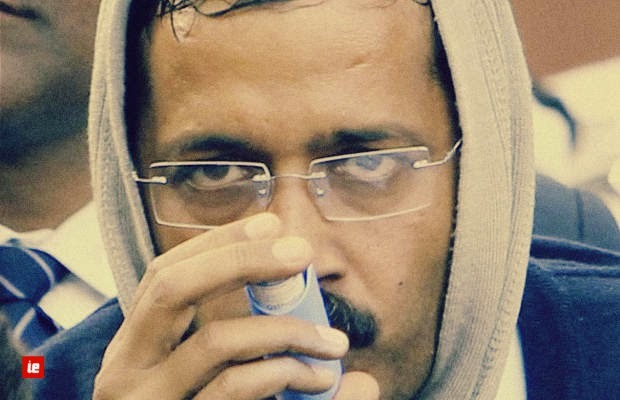 Indian Exponent: A Superman Who Couldn’t Even Crawl - Will AAP be the “Tehelka” of Politics?